Final price: FREE plus $0.52 Money-Maker! This week CVS is offering $2 in Extra Care Bucks (ECB) when you purchase Lady’s Speed Stick Stainguard deodorant. You can use coupons and get this deodorant for FREE! Final price: FREE plus $0.51 money maker! 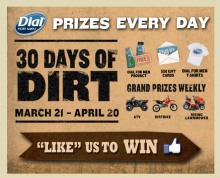 Dial is hosting a sweepstakes right now over at Facebook. You can win a variety of prizes. They are giving away products, gift cards, t-shirts, and even a riding lawnmower. Just head over to Dial and find out how to enter to win. 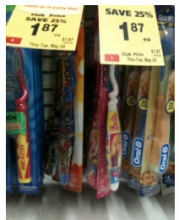 Offers Mar 31, 2011 in Facebook, personalcare · Expired!